The Angry Birds game has become very popular lately. If you don’t know :), Angry birds are the birds that you use instead of shells for shooting at green pigs from a sligshot. We are often asked how to learn to draw angry birds. 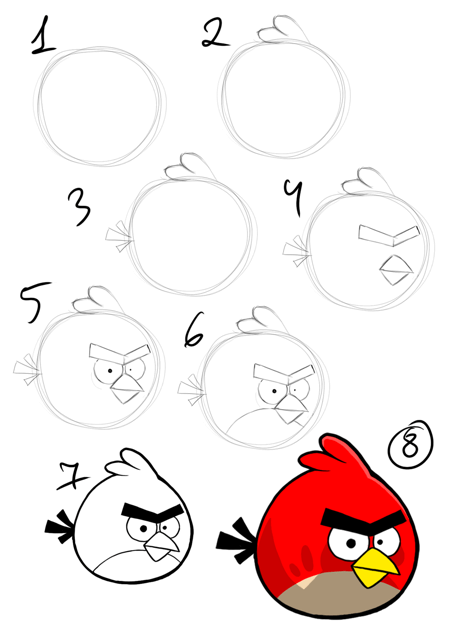 By popular demand we present to you step by step instructions how to draw angry birds. First, carefully examine how the birds look like. First of all, almost all of them are round in shape. It’s because they are used as shells in the game, and we all know that it is a streamlined round shell that better hits the target and flies farther. There is a triangular yellow bird, though, but its angles are also quite smooth. Second, the birds are made angry so that kids (and adults, too) won’t be sorry for the birds when they shoot at a target. Their angry character is transmitted by an angry look in their eyes and frown eyebrows. Third, only a few crest feathers and a few tail feathers are outlined in the detail, no wings, no legs to be seen. And there’s no need in them in this case, because an angry bird does not fly on wings, it is accelerated by a slingshot and its legs will only prevent it from picking up speed. 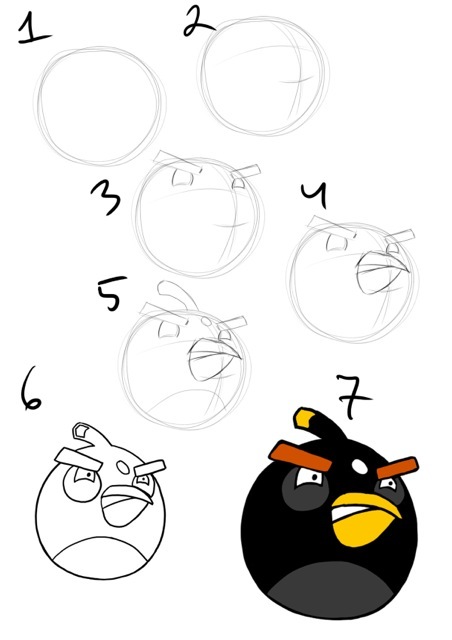 At first glance it seems that drawing an angry bird is easy. Draw a circle, draw eyes in the circle, then eyebrows and a sharp beak, plus a few feathers on the top of its head and in the tail. And the drawing is ready. But it wasn’t to be. 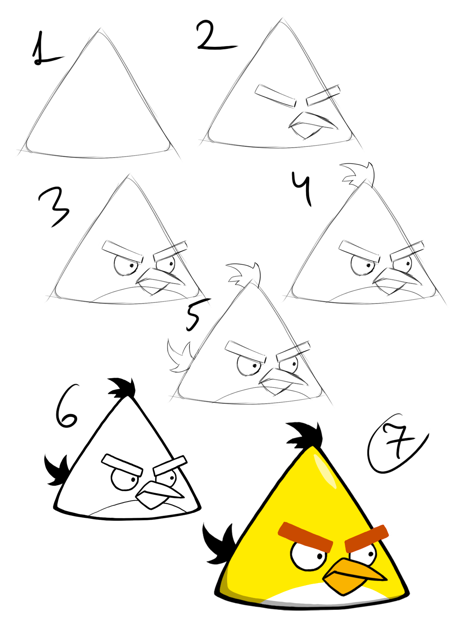 Now we will share with you some of the secrets on how to draw better these angry birds. Step 1. Draw a circle, which is the body of your bird. Step 2. Draw a pair of large feathers on the top of the circle. Step 3. Draw a tail in the form of three rectangular feathers in the back. Step 4. Now draw frown eyebrows and a sharp clenched beak just below the eyebrows. Let the tip of the beak curve slightly downward. This will emphasize the mood of the bird. Step 5. Let’s start drawing angry eyes. Note that they are also shifted and partially hidden under the eyebrows. Step 6. Separate a body of the bird by drawing a semi-circle at the bottom. Step 7. Сircle the bird with a thick black line. Paint eyebrows and a tail in black. Step 8. Make the beak yellow. Now paint the rest of the bird in deep red leaving only the eyes, and paint the bird’s belly in beige. You can also put some shades and light. That’s it, the red angry bird is ready. Step 1. First, draw a body of the yellow bird in the form of a triangle. Angles should be slightly flattened to make a streamlined shape. Step 2. Draw wide rectangular eyebrows, make them tilt down to the center to give the bird an angry look. Under the brows draw a large sharp beak slightly elongated. Step 3. Draw big round eyes. Separate with a semi-circle the bird’s belly. Step 4. Draw a crest on top. It should consist not of individual feathers, but a beam of feathers. Let the crest be bent sideways. Step 5. Draw a tail, also consisting of a bundle of feathers. The tail should be turned up. Step 6. Outline the contour of the bird with a thick line and paint the tail and crest in black. Step 7. Make the bird yellow, and its beak bright orange. Eyebrows should be light brown. The yellow bird is ready. Step 2. Schedule by auxiliary intersecting semi-circular lines a place for eyes and a beak. Step 3. Draw two thick eyebrows in the form of slanted rectangles. But unlike the red bird, they shouldn’t converge at an angle on the nose bridge.Draw small round eyes under the eyebrows. Step 4. In the center draw a closed beak. Step 5. Draw a rectangle of the tail on top, outline a belly with a half circle at the bottom, draw a white circle on the forehead. Step 6. Erase auxiliary lines, outline the contours thicker. Step 7. Paint the bird in black. Make gray circles around the eyes, paint the belly in gray, too. Make the tip of the beak and the tail bright yellow. Eyebrows should be orange. The black bird is ready. And now try yourself to draw other bird characters of this popular game. Next story The First in educational apps!